Throughout much of the world, frog populations are declining and some species are disappearing totally. In Australia, several species have become extinct in the past 25 years. 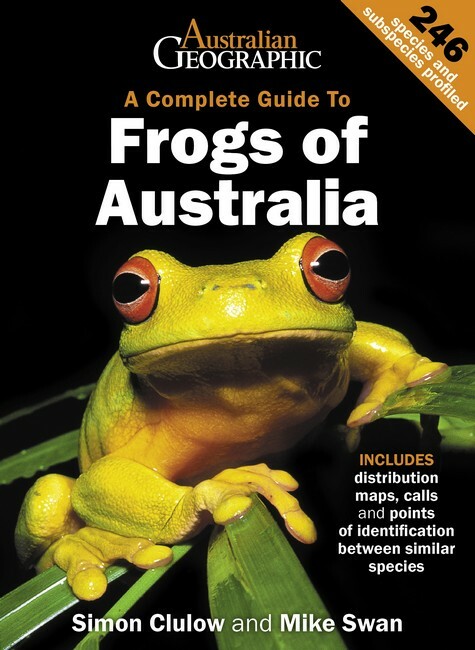 This guide provides concise accounts of all the known frogs of Australia. There are 230 species within the five native frog families: Hylidae, Limnodynastidae, Microhylidae, Myobatrachidae and Ranidae. Also included are the introduced cane toad and nine stowaway species that have arrived in Australia. The text for each species includes details of size, status, distribution, habitat, behaviour and advertisement call. Each species is accompanied by a map of Australia showing its known distribution, and full-colour photography. Closely related frogs are shown in identical poses so that comparisons can be made readily. The introductory section of the book covers frog biology and habitats and includes notes on families and genera. Australian Geographic, October 2018. 304 pages, Paperback, colour photographs, maps. An invaluable tool for scientists and amateur naturalists. Using meticulous scientific keys, this book teases out the differences between tadpole species and enables both scientists and amateur naturalists to identify what species of frog tadpole will become. This book will serve as an invaluable tool for monitoring frog populations and thus contribute towards out understanding of just what is causing the present alarming worldwide trend towards massive frog declines. The first part of the book deals with frog classification, collecting and raising tadpoles, the prevailing laws in each State and the issues surrounding the decline and conservation of these amphibians. Part two is concerned with the scientific method of identifying tadpoles by means of keys. There is even a key to frogs’ eggs. 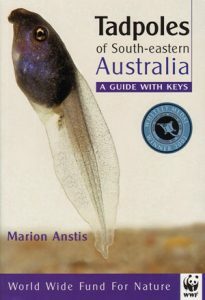 The third and major part of the book features all 84 species of tadpoles – and frogs – living in Tasmania, Victoria, New South Wales and just over the border to Queensland. This book has been co-sponsored by the World Wide Fund for Nature. Artist/Author: Tyler, Michael and Steve Walker. This third edition is in colour and includes five species of frogs not listed in the earlier editions. Detailed distribution maps pinpoint precisely where each species has been found. 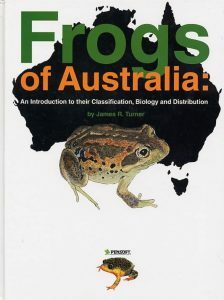 This book introduces the Australian frog fauna and includes a painting of, and distribution maps for each of the 213 species and 5 sub-species of Australian frogs currently recognised in 2003, mostly based on Dr H G Coggers’ taxonomy. More than 110 new species of Australian frogs have been discovered and described since 1960. The five Families of frogs found within Australia are dealt with, followed by details of the Genera within each of the Families. The individual species are arranged in alphabetical order using their common name. However a Quickfind index is provided at the front of the book to enable those familiar with scientific names to go directly to any Family, Genus or specific species. The text on each species has clear, precise information. 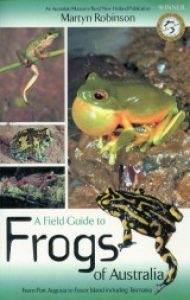 A Field Guide to Frogs of Australia will help you identify all the frogs hopping and croaking their way around Australia. A key, with drawings of distinguishing features, plus a colour photograph and distribution map of each frog, will help you to identify your species. 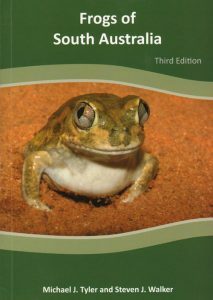 This book has been developed from the New South Wales Frog Watch Programme, a frog-monitoring programme involving schools and amateur herpetologists.